Estimate grass seed quantity for new planting or overseeding. Choose the tab that corresponds to your land measurement and enter the size of the lawn. The calculator will display the amount of seed you need in total pounds, as well as pounds per 1000 square feet (sq. ft) and kg. per 1,000 sq. m. Read below for more information. (Re) Seeding Grass – How Much Seed Do I Need? When creating a lawn, there are basically two options, either lay sod (pre-grown grass that comes in squares or rolls) or plant grass from seed. There are advantages to each method. Laying sod provides an instant lawn that can be installed in nearly any season, quickly eliminating muddy, unattractive yards. Sod is fast to lay down and is available in several varieties. All this convenience comes with a substantial price tag, though. On average, a homeowner spends almost $2,000 to sod a new yard. If you are considering this option, try our sod calculator to figure an estimate for your project. Grass seed is a cost-effective alternative to sod and offers a few other advantages as well. There are many more varieties of seed available than varieties of sod. And, planting seed allows the grass to establish itself directly in the environment in which it will live. The drawback, of course, is that seed takes time to grow and must be planted at the proper time of year to be successful. This can mean a long wait until you have grass to mow. Grass seed makes up for it in cost savings though and is the best alternative for filling in bare spots in existing lawns. You can use our contractor locator tool to help you find contractors willing to assist with your project. Lawn grasses are usually classified into either warm season or cool season grasses. The different varieties offer different textures, hardiness, and drought tolerance. They also require different amounts of seed to grow into lush lawns. Warm season grasses grow better in warmer climates, including the southern US. Bermuda, St. Augustine, and Zoysia are warm season grasses. Cool season grasses thrive in cooler temperatures or climates with temperature fluctuations. Fescues, Kentucky Bluegrass, and Ryegrass are beautiful cool season varieties. Besides variety, how much grass seed you use also depends on whether you are growing a lawn from bare soil or over-seeding an existing one. New lawns generally require about twice as much seed as overseeding. Coverage rates are often indicated in pounds of grass seed per 1000 square feet of land covered. Your supplier will know the coverage rate for the variety you’re purchasing or see the table below for recommended coverage rates for common varieties. Grass seed coverage rates for common grass varieties. If you are using the calculator above, you can skip this section, and get right seeding your lawn! Try our lawn mowing calculator to estimate how long it will take to mow your new lawn. If you want to calculate by hand, read on! 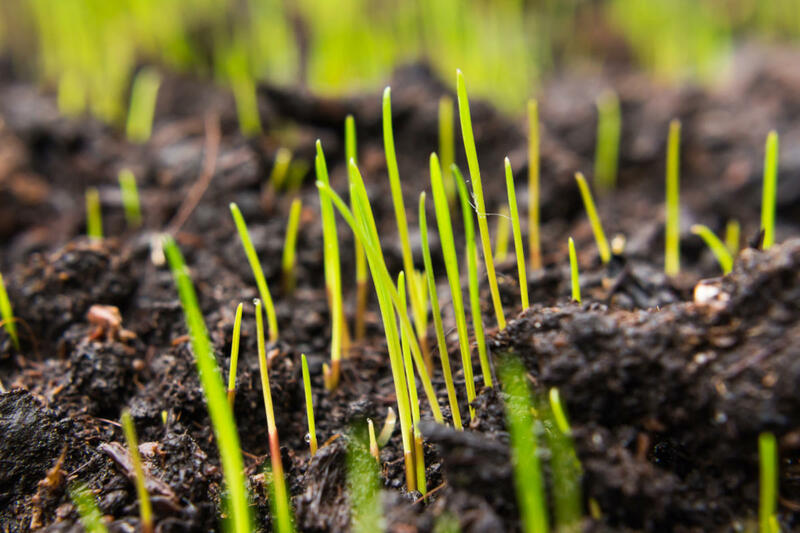 To calculate the total quantity of grass seed you will require, you will need to know the type of grass you want and the size of the area you’re planting. Since most coverage rates are given per 1,000 square feet (or square meters), you will need to end up with those units. If your area is smaller, simply measure it in feet or meters. Then multiple the sides together. Done! If you already know the acreage size, you can convert acres to square feet using our acres to square feet conversion calculator. Or, multiply the number of acres by 43,560 sq. ft. If you are unsure of the acreage, use our map-based acreage calculator to find out. After you’ve found your square footage, divide it by 1,000. All that’s left to do is multiply your area (in 1,000’s of sq. ft.) by the amount of grass seed recommended for your grass type. Now you have the total number of pounds of seed needed. Take the total-pounds number to your supplier and pick out your seed. Grass seed is usually sold by the bag (10lbs, 20lbs, and 50lbs), so you can use your result to figure out how many bags you need. Suppose you have a new yard that is 0.23 acres that you want to plant Sun & Shade Mix. 0.23 acres × 43,560 sq. ft = 10,018.8 sq. ft.
10,018.8 sq. ft. ÷ 1,000 = 10.02 thousand sq. ft.
From the table above, Sun & Shade Mix requires 6 lbs. of seed per thousand sq. ft. for a new planting. One 50 lbs. + one 10 lbs. bag will be sufficient for your project.